Description: This is the home you've been waiting for, awesome 4 bdrm ranch w/ 4 baths, scenic country views on dead end rd. Gourmet kitchen with island, double oven, walk-in pantry & wine refrigerator opens to large dinette & elegant great room with fireplace. 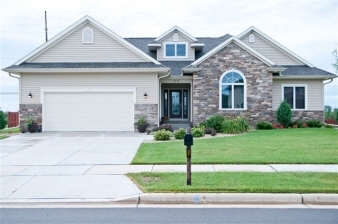 Master suite with large walk-in closet, master bath with whirlpool & separate shower. The walkout ll includes a huge family room w/billiard area, exercise rm/den with french doors, large 4th bdrm w/walk-in closet & full bath. Fenced in yard, patio & deck.